You want to feel peaceful at home. One of the best ways to do that is to make a Zen meditation room. In this guide I will show you how. If you’re a proud home owner who loves meditating, you are going to get so much out of this guide. How to create the perfect space so you can meditate in your home. And by the end of it, you’ll be well on your way to having a stunning new meditation space where you can do your own DIY meditation retreat. Why make a meditation room at home? Having the proper space to meditate in is an important part of practice. This can be a DIY meditation room. Or you might like to create a meditation garden. When you make a meditation room, it needs to reflect the mood you want to achieve when you’re meditating. For most people you will want what I call a “Zen-sational” relaxation zone (catchy name, ay?). It’s a place that when you enter it you immediately feel yourself relaxing. Have you ever been to a Buddhist temple? They are wonderful, relaxing places. You want the meditation space to conjure that same sort of feeling. Your home is your temple. And you want your home to help you to find inner peace, to help you to reach enlightenment, and to help you to unwind and relax. Good meditation room design promotes relaxation and inner peace. So. How to make a meditation room. Well, first lets discuss meditation room design. Whether you are looking for a zen room, Buddhist room, Japanese room or any other type of meditation space, these simple instructions are all you need.And once you are finished you will be able to do your own meditation retreat at home. It’s a wise choice to dedicate one of the rooms of your home to meditation. And you might also like to do yoga at home. Do you live in a house? An apartment? A condominium? What type of home do you have? Is it large or small, new or old? Whatever type of home you live in, there will be room to create a meditation space. I’ve seen meditation spaces in mansions and I’ve seen them in much more humble homes too. But of course, the size and type of home that you have will affect the design of your meditation room. In some cases it will not be a meditation room” but more of a space taking up part of one room. You can make a meditation room wherever you are. But first of all, decide where in the house will you make your meditation room? Or, or, if needs be, decide which specific part of a room you will use (for instance, you might choose to use one corner of your basement for a meditation space). When you decide which part of your house to make into your DIY Zen meditation room, you will immediately get a sense of how you want the meditation room to be designed. For instance, if you’re choosing to use a corner of your lounge, and your lounge happens to be modern, then you will want the meditation space to reflect the style of the rest of the area. You’ll want it to be modern and comfortable like the rest of the lounge. Of course, if you’re choosing to dedicate an entire room of your home to meditation then you have more options. In that case you can design your Zen meditation room however you like. So, do you have your pen and paper, or a computer document open? Somewhere you can make some notes? No? -Go grab something you can take notes. – Write down where in the house you will create your Zen meditation room. You know you want to make a room for meditation. But do you know what type of meditation you’re going to do there? This will effect the meditation room’s design. Your actual meditation practice will heavily influence how you design your meditation room. The majority of beginner meditators use two types of meditation: breathing meditaitons and guided meditations. Is this you? If so, there are a few important things to bear in mind when it comes to designing a meditation room. Treat yourself. Listen to this beautiful meditation music. If you are going to do breathing meditations you will need the meditation space to be a quiet space. Is that easy to achieve in your house? Or are your kids constantly making noise? If your home is noisy how are you going to quieten it? You could choose to soundproof your room (you can do this quite economically. Take a look at Chris Woodford’s guide to soundproofing a room on Explain That Stuff. Buddhist meditation rooms will need specific items. For instance, you might like to have a Buddha statue, a mani stone, or other items that reflect Buddhism and the teachings of the dharma. After all, no Buddhist meditation room is complete without some Buddha-related items. If you’re creating a yoga meditation room you will need space to move. Your yoga meditation room will also need a yoga mat and a fair amount of real estate. For instance, if you’re doing dynamic meditation you are going to be throwing your arms about and you will need to avoid injury. And your yoga meditation room may also need a mat, blocks, and other items. So far we have chosen where your meditation space will be and what type of meditation you will do there. And we have looked at specific requirements for different meditation techniques. Now let’s talk about room design. You will want to consider colour therapy when designing your meditation room. Different colours have different psychological traits (for instance, blue is calm, purple is spiritual). Bear this in mind when you choose the colours for your room. Do you want an exciting yoga meditation room in oranges and reds, or a relaxing Zen meditation room in greens and blues? If you are designing a Feng Shui room, remember to go by the Feng Shui Bagua. Let’s take a look at how different colours will affect the meditation practice. What colour should your Zen meditation room be? Red: Red is a fantastic colour for increasing vitality. Lots of temples are red because red creates feelings of warmth and love. But for some this colour will be too exciting and not conducive to relaxation. This colour also makes people impulsive (which is why most fast food restaurants use red in their logo and decor). White: White creates feelings of purity and calmness. This is a very good colour for a Zen meditation space. Grey: Greys make you feel more productive and more grounded. So if you want your meditation space to be a good grounding space, grey is a good choice. Orange: Orange is a warm, happy, and optimistic colour. If you’re one of my “positivity warriors” then this is a great colour for you. If you’re designing a yoga meditation room and you want that positive energy, go with orange. The space will be full of positive energy. Yellow: Yellow is an optimistic and happy colour good for a Buddhist meditation room or yoga space. If you’re doing meditation techniques like Smiling Buddha Technique and other meditations for happiness, yellow is a good choice. Pink: Pink rooms are calm and create warm feelings. Pink rooms are good for practicing meditations for love, but not the best for other meditations. Purple: In terms of colour psychology, purple is the colour of spirituality and helps you access the spiritual parts of your mind. So one of the best ideas for a spiritual meditation room is to include some purple. Brown: Brown is the colour of Earth and is grounding. Great choice for a Zen meditation room, especially when mixed with grey. Of course, you can use colour combinations. Temples are a combination of red (warmth and love), yellow (positivity) and brown (grounding). You can learn more about colour combinations on House Beautiful. When you’re thinking about how to design your own meditation room at home, consider the features and meditation furniture you would like to have there. It’s very important to choose one of the best meditation cushions. Whenever you meditate it is very important that you are comfortable and that you have good posture. If you’re not comfortable you will not be able to focus and your practice will be affected. That’s why a meditation cushion is so important. To help you out, I’ve create a guide to the best meditation chairs. A no-brainer really. If this is a yoga meditation room you will need a good meditation mat or yoga mat. These are economical and play an important rule in your practice. If you’re designing a yoga room your mat should be one of your first considerations. Meditation crystals are one of the most popular items. If you would like to practice crystal meditation, choose a crystal that works with the area. Take a look at my guide to crystal meditation for more on this. If this is a Buddhist meditation room, a statue is a must. I’ve put together a guide to the best Buddha statues. If this is a Buddhist meditation room, you might want to include a Tibetan Singing Bowl. Take a look at Tibetan Singing Bowl Buying Guide for more on this. Who doesn’t love the sound of water when they’re meditating? 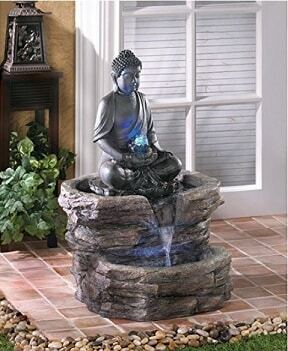 Install a water feature and you’ll feel like you’re living in the heart of nature while you’re mediating. Salt crystals are very popular at the moment. The theory is that they make your Zen meditation room healthier by producing negative ions in the air. In my experience, near everyone who is into spirituality is also into art (I know I am). So that is probably true for you too. And if that’s the case, you might like to include some artwork for your walls. Nature is the most beautiful and pure element in the world. And it is valuable to meditation practice too. That why when you’re doing Zen room design you should include natural elements. Ask yourself what natural elements you can introduce to your room. We have already discussed water features, which make for beautiful features. And you might like to include plants next to that water feature. The best plants for meditation rooms include aromatherapy plants like jasmine and Lily of the Valley. Another option is detoxifying plants like Bamboo Palm and Peace Lily. These are all good plants for a meditation room. 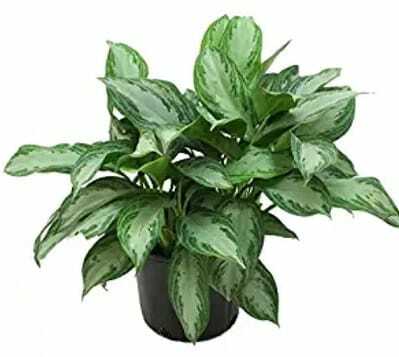 I chose a Chinese Evergreen, which is pretty and is great for detoxifying the air. Fresh air is very important in a yoga meditation room, especially if you’re going to be exercising vigorously. Remember, you may be using this room for physical exercise like yoga, tai chi and qigong as well as meditation. Your lungs will thank you for the fresh air. Fresh air is also very relaxing and will help you to focus when you are meditating. Fresh oxygen helps keep the brain healthy and the mind alert. So it is absolutely essential for meditation. Plus, the feeling of the fresh air on your skin will help you to let go and unwind. And, this is doubly important for yoga rooms or tai chi rooms, because your body needs the oxygen even more in that case. You will need at least one window in your meditation room. But for the best effect you might like to use a ground floor room with a sliding door so that you can open the door and feel like you are living in nature. 7. When you design a meditation room, remember the lighting! Different qualities of lighting produce different moods. Think about how a romantic table for two is lit compared to how a store is lit. You can use lighting to influence your mood when you are in your meditation room. For a great guide to mood lighting, take a look at The Neighbor Newspapers article. Because lighting is so important, you might benefit from having lights with dimmer switches so that you can change the brightness. That way when you’re doing yoga you can have the room well-lit, and when you’re doing Trataka (gazing at a candle) you can dim the lights. With the tips above you will create a meditation space that is both practical and beautiful. Take your Zen to the kitchen with our guide to the Zen Of Cooking.